There is often a requirement to maintain and add URLs to the security zones of Internet Explorer. As we discussed in the last couple of posts, Internet Explorer Maintenance (IEM) has been deprecated with Internet Explorer 10. 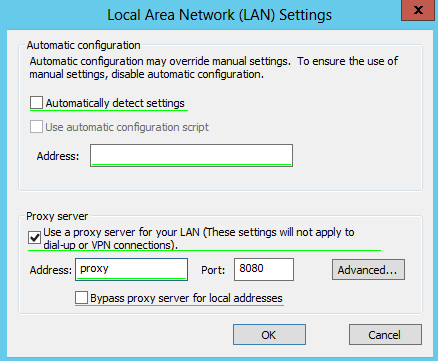 This post will look at two ways to leverage group policy to manage the security zones. The first method will remove the option for the end user to edit or change the security zones, the second will allow the user to add or remove sites. Create a new Group Policy Object and browse to User Settings -> Administrative Templates -> Windows Components -> Internet Explorer -> Internet Control Panel -> Security Page. 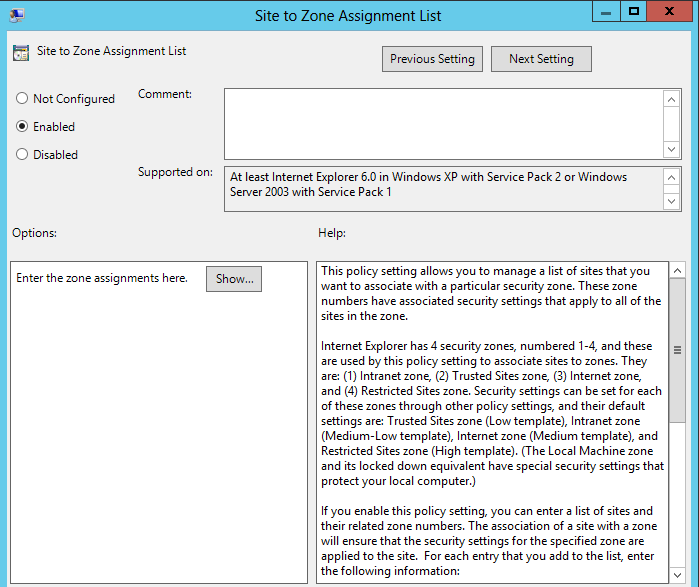 Double click on the Site to Zone Assignment List, select enable and choose show to configure the options. Note the numbering of the Security Zones. 1 for Intranet Zone, 2 for Trusted Sites, 3 for Internet Zone and 4 for Restricted Sites Zone. 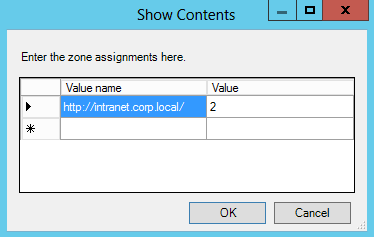 In this example I have added http://intranet.corp.local to the Trusted sites (2). 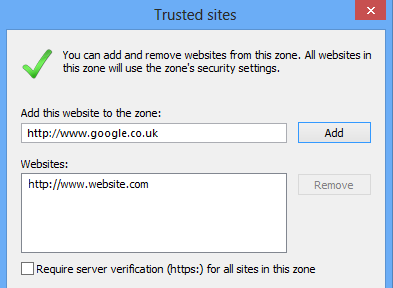 Using this method will grey out the Trusted sites GUI, meaning the end user cannot remove or add any sites to any of the zones. If you would like to be a little more flexible and allow the end users to edit the zones you will need to use an alternative method. Group Policy Preferences Registry Items. Consider the implications of allowing this, as users can add their own sites and potentially reduce the security settings for a given site. 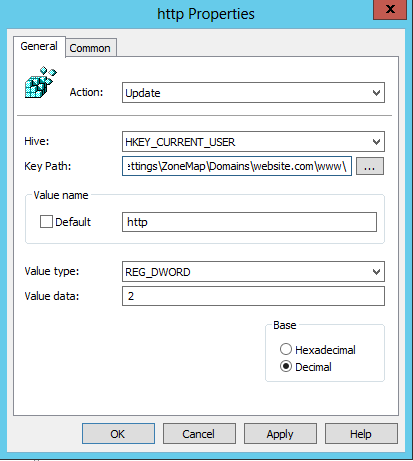 This method will allow you to deploy Security Zone sites, whilst allowing the end user to modify the zones by adding or removing sites. 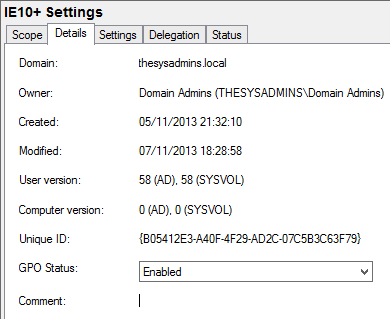 If a user removes one of the sites deployed via this method, it will be re-added on the next Group Policy refresh. I’ve covered deploying registry settings via Group Policy Preferences in a previous post, so you may want to have a quick scan if you’re not familiar. 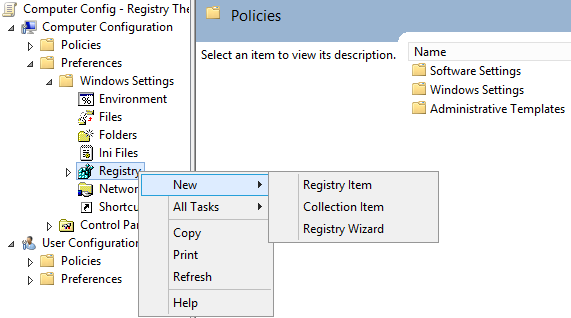 Create a new Group Policy Object and browse to User Configuration -> Preferences -> Windows Settings and Registry. Right click and choose new Registry Item. This is where you’re configure the sites, you will need 1 registry item per site. Value Data uses the same as Site to Zone Assignment. 1 for Intranet Zone, 2 for Trusted Sites, 3 for Internet Zone and 4 for Restricted Sites Zone. This is what you will see on the client machine. If you want to set the “Require server verification (https:) for all sites in this zone” with this method, you can do so by setting the following. With Internet Explorer 11 being released a couple of days ago for Windows 7 / Server 2008 R2 and Internet Explorer Maintenance being deprecated since IE10- you’re going to want to use one of the alternative methods (Group Policy Preferences, Administrative Templates or the Internet Explorer Administration Kit) to configure Internet Explorer for your organisation. 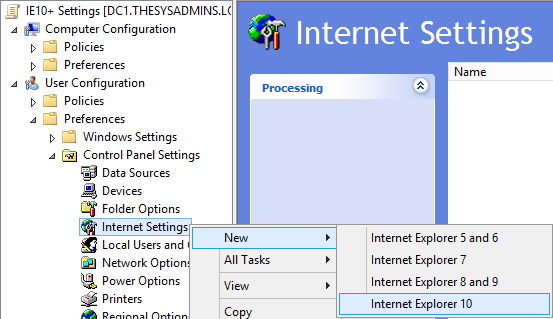 If you’re used to configuring Internet Explorer with Group Policy Preferences, you’ll be thinking “not a problem” and install IE11 onto an administration machine or a server assuming it will add the option to create a new GPP for Internet Explorer 11. This is what you’ll see if you try that. 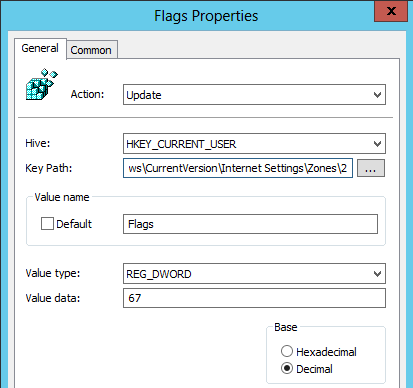 Note – You will need Windows 8 / Server 2012 or above with RSAT to see the Group Policy preference settings for Internet Explorer 10. 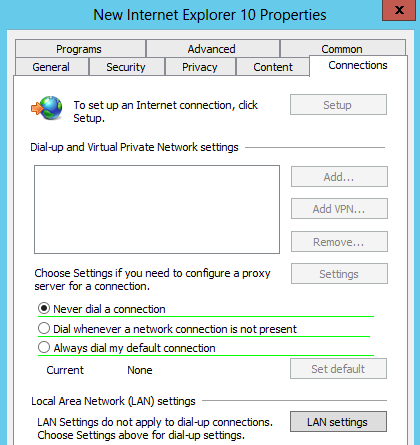 Where is the option to add an Internet Explorer 11 Group Policy Preference Internet Settings Policy? There is no option. The Internet Explorer 10 option actually covers Internet Explorer from version 10 to … 99! That’s right 99. To prove this and to visually confirm this is the case, create a policy by using Internet Explorer 10 Internet Settings and find the unique ID of the GPO. Browse to \\DC\SYSVOL\Domain\Policies\uniqueID\User\Preferences\InternetSettings and open the InternetSettings XML document in notepad. 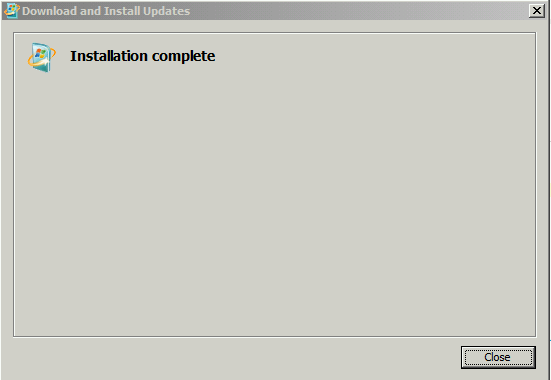 Note the 5th line which states version 10.0.0.0 -> 99.0.0.0. 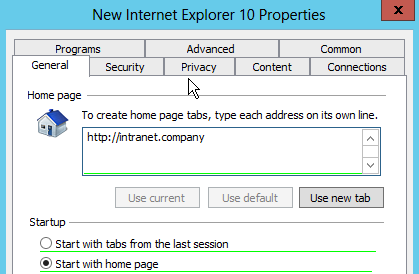 If you’re looking to use Group Policy Preferences to configure Internet Explorer 11, using the Internet Explorer 10 Internet Settings option will work for version 11 and future releases of Internet Explorer. 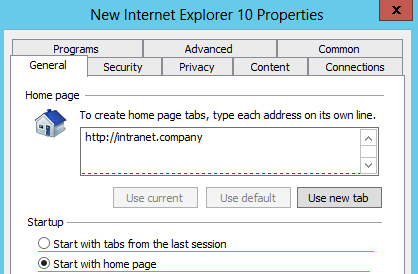 If you’ve used Group Policy Internet Explorer Maintenance (IEM) to configure your organisations Internet explorer settings and are looking to upgrade to IE10 or above you will find that the settings defined with IEM will no longer work. Not only that but if you try to modify the GPO from a machine running IE10 you will not be able to modify the GPO settings. Settings configured with IEM are not automatically removed when you upgrade from IE9 -> IE10, however any changes made to the IEM GPO will not be reflected by the clients and any new users logging onto a machine with IE10 will not receive the IEM settings. 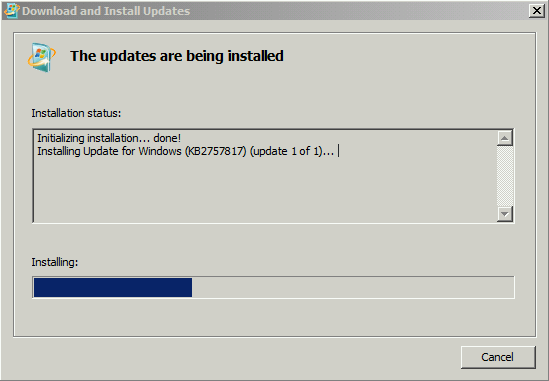 If UserA is logged onto a Windows 7 machine running IE9 and the user updates to IE10. The settings from IEM will be retained- but not enforced by Group Policy. If UserB logs onto the same Windows 7 machine for the first time after IE10 has been installed, they will not receive any IEM settings. If you are deploying or using Windows 8 (which ships with IE10) no settings from IEM will apply, ever. IEM has been dropped in favour Group Policy preference, Administrative Templates and the Internet Explorer Administration Kit 10 (IEAK 10). This post will run you through a couple of common settings you may need to migrate across. I will cover setting the home page and proxy settings. 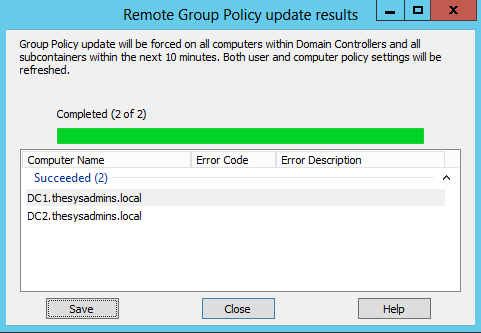 Open the Group Policy Management Console and create a new GPO. Browse to User Configuration -> Preferences -> Control Panel Settings -> Internet Settings. Right click and choose New -> Internet Explorer 10. Why isn’t IE11 listed? See here. Press F5 to confirm entries made to Group Policy Preferences Internet Settings, basically- make sure you’re green! 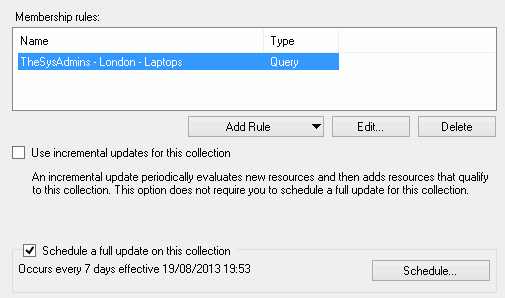 Device collections in System Center 2012 Configuration Manager represent a logical container for a grouping of devices. These collections can then be used to perform a number of tasks, such as deploying software, compliance settings or task sequences. I’ve outlined 4 of the most common collection types below. 1. 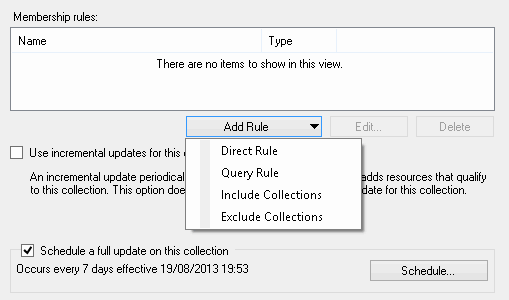 Browse to Assets and Compliance, right click on Device Collections and select “Create Device Collection”. 2. 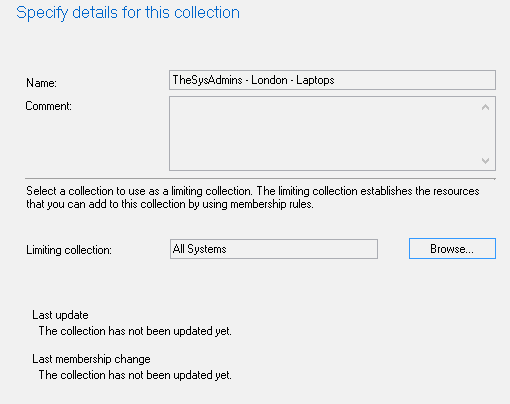 Give the collection a meaningful name, and set the limiting collection. 3. 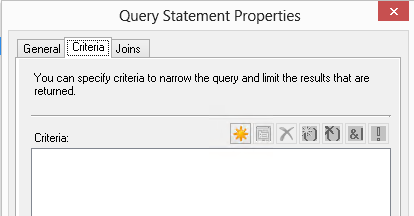 Add a Query Rule. 5. Head to the criteria tab, and click on the new star item. 6. 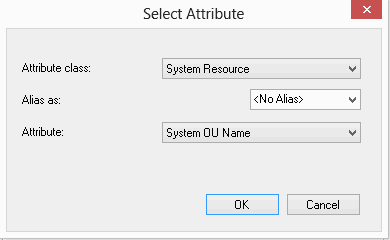 Click on Select, and set the attribute class to System Resource and attritube to System OU Name. 7. Operator should be set to is equal to, click on values to choose the desired OU. It should read Domain/OU/ChildOU. 8. Next, Next through the rest of the wizard. 9. The device collection has now been created. 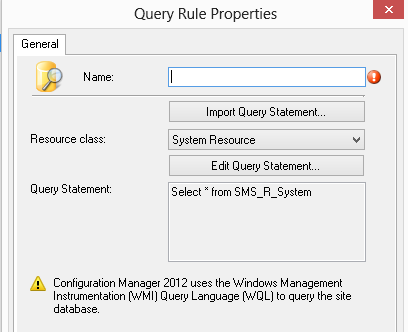 select SMS_R_SYSTEM.ResourceID,SMS_R_SYSTEM.ResourceType,SMS_R_SYSTEM.Name,SMS_R_SYSTEM.SMSUniqueIdentifier,SMS_R_SYSTEM.ResourceDomainORWorkgroup,SMS_R_SYSTEM.Client from SMS_R_System where SMS_R_System.SystemOUName = "THESYSADMINS.LOCAL/LONDON/LAPTOPS"
Group Policy Preferences allow you to deploy and modify registry settings quickly and easily. This post will run through a couple of examples to give you a starting point and some guidance for using this in your own environment. As with any Group Policy based changes, use a test Organizational Unit to confirm and test changes before making them live. 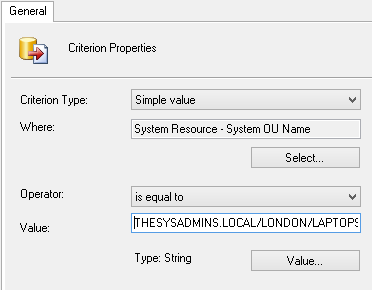 You have made some changes to HKEY_LOCAL_MACHINE on a reference machine, and would like to deploy the same registry settings to an OU of computers. 2. 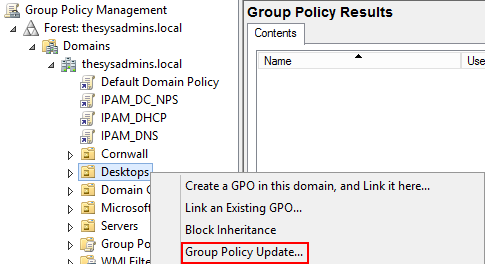 Right click Group Policy Objects and select New, give the GPO a meaningful name, this does not link it to an OU so will not affect any computers or users. This is a good practice to get into. 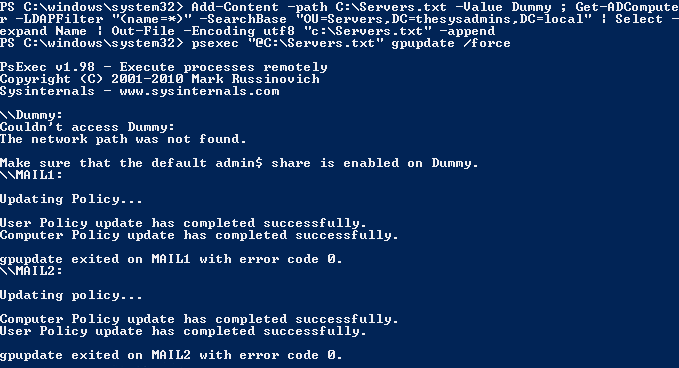 If you create at a live OU level, any changes (and mistakes) will be deployed if you’re unlucky enough for the computers or users to perform a Group Policy refresh as you’re creating the GPO. Always link the GPO later, when you have tested it. 4. 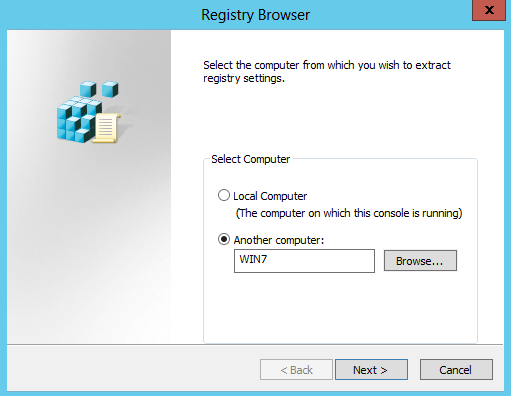 Expand Computer Configuration, Preferences, Windows Settings and head down to Registry. Right Click and select New, you will be present with 3 options. 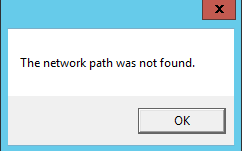 When using the Registry wizard, the remote computer must have the Remote Registry service enabled, otherwise you will be greeted with the error message “The network path was not found”. It will then allow you to select items from the HKEY_LOCAL_MACHINE and HKEY_USERS on the remote machine, if you need other areas of the registry you will need to install the Remote Server Administration Tools onto the reference computer and add the Group Policy Preferences Console via Programs and Turn Windows Features on or off. 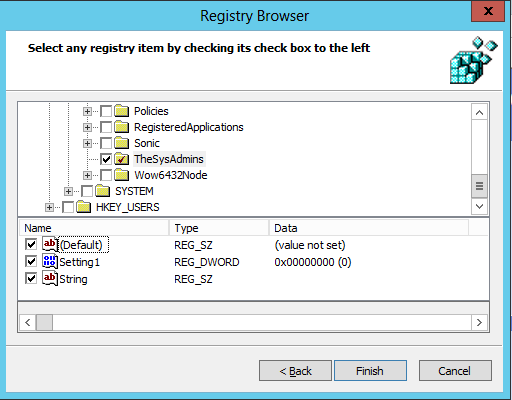 Run through the same process on the remote machine’s console to import the relevant registry items. In this example we’re okay, as we want to pull settings from the HKEY_LOCAL_MACHINE. 5. Browse to the required location and tick the required keys and values to import into the GPP. Click Finish. If you ever notice that the hive column isn’t populated after the import, double click on the entry or right click and select properties. Without changing anything click OK, this will then populate the hive entry. I’ve only seen this a couple of times… but if it isn’t populated the settings won’t get deployed, so it’s worth mentioning! 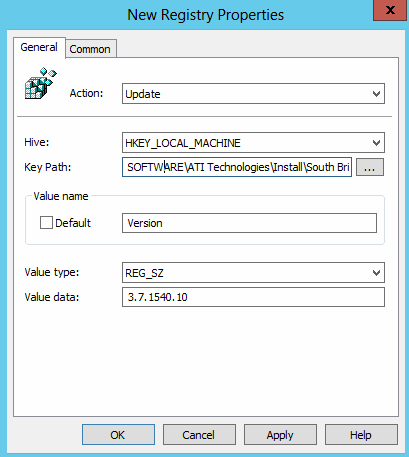 If you want to manually add, remove or change a registry key you can do so using the registry item. You can only add one entry at a time with this method. Example below, it will create new keys if needed so if you enter HKEY_LOCAL_MACHINE\Software\1\2\3\4\5 it’ll create the 1,2,3,4,5 keys if they are not already present. 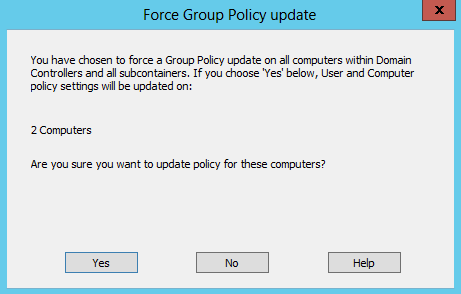 The default behavior when using Group Policy Preferences to modify the registry is “update”. Let’s look at the 4 options and what they mean. Let me expand on the 2nd point. If there is already a DWORD with the value of 1, and you create a Group Policy Preference with the same DWORD set to 2 with the option of Create- nothing would happen to the DWORD. It would remain at 1. It is important to understand that Group Policy Preferences doesn’t lock the registry item, it merely (as it’s name suggests) uses it as a preference. So if you set a DWORD to 1, depending on the area of the registry a user could go and set that to 0 which would stick until a Group Policy update occurred and the item was re-evaluated. There aren’t many situations where you would need to delete an item before populating it again, I can’t say I’ve used this to modify registry items before. But there may be a case for you to use it. I’d like to thank you for reading and I hope it’s been informative for you!